I’m the Managing Director for Loop Abroad, which means I get to shape the itinerary for each of our programs. I often get asked why we don’t ride elephants, which is easy enough to do in Thailand. Recently, at a summer opportunities fair in Connecticut, I made the rounds to the other tables in the room and collected a pile of summer program brochures. There were other programs in Thailand. Of those, most included an interaction with elephants. And all of those included elephant riding. Some could argue that riding elephants isn’t necessarily bad. Many elephants were domesticated for logging, and when that was outlawed in Thailand two decades ago, those elephants were left jobless. Without a way to earn their keep, these elephants wouldn’t have survived, or would have been moved to Burma to continue logging there. If they are well-fed, cared for, and given plenty of love, water, and shade, elephants can have a pleasant life while earning themselves and their keepers a living by giving rides. But unfortunately, there is very little economic incentive to treat riding elephants well. They often have to live solitary lives in a small space, and they are often exposed to the vibrations and noises of nearby trucks and cars, which can cause them great stress and discomfort. Elephants are large, powerful animals. To trust them to safely carry visitors on their backs, they must be trained. That training involves separating them from their family at a young age, trapping them in a small cage, and beating them with nails, sticks, chains, knives, or stones. The elephant must then be controlled with a stick or metal hook going forward. When I first visited the Elephant Nature Park in 2009, what I didn’t see gave me hope for the future of domesticated elephants in Thailand and Southeast Asia. The elephants at the sanctuary weren’t required to work to earn their keep. There were no elephant painting shows, no elephant rides for sale, and there were no elephants pulling logs from the nearby forest. To the contrary, I saw that the elephants at ENP spent their days doing pretty much what elephants without jobs do: just being elephants. This was all thanks to a women named Lek Chailert, founder of the Elephant Nature Park sanctuary in Chiang Mai, who was helping to introduce a new model of elephant rescue to Thailand. Like Lek, we believe that elephants all over the world should be able to live in peace and just be elephants. 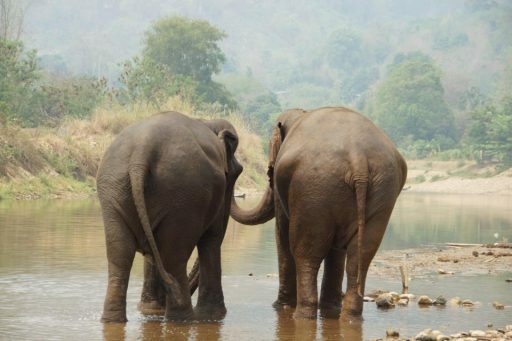 We also believe that the sanctuary model developed by Lek at the Elephant Nature Park is sustainable and allows for safe, positive, and harmless interactions between travelers and captive elephants. The sanctuary model is spreading in Thailand. With Lek championing the cause, more than 14 elephant camps have taken off the saddle. This means they no longer offer elephant rides to travelers and the elephants at these camps get to spend their days being elephants. This is positive change and a movement we are proud to support. So, we don’t ride elephants. We know that might be a disappointment to some of our students who picture themselves riding an elephant through the jungle. Our students feed the elephants, wander with them, care for them, and learn their stories. But we don’t ride them – and we think once you get to know them, you’ll agree that that’s a good idea.